Nestled between rocky slopes of the Alps Switzerland, the small resort village - Stechelberg lies in the beautiful foothills of the majestic Mount Jungfrau and its eternal companions Mönch and Eiger. Stechelberg is located in the glacial valley of Lauterbrunnen, at the entrance of the upper section. It is part of the Swiss resort area in which cars are completely forbidden, so you have to leave them at the special parking spaces at the beginning of the valley. Stechelberg is connected by rail and by lift located above Mürren and Schilthorn. 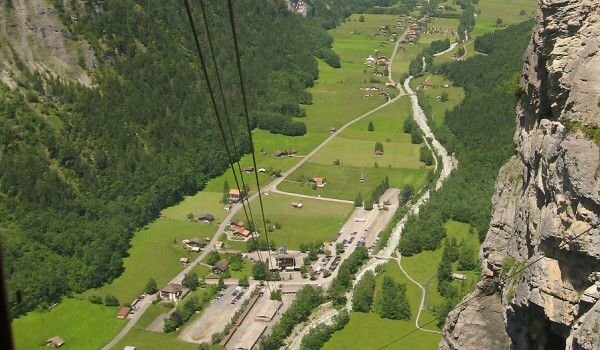 The traditional Swiss village is located at 922 m altitude, and it is easily reached by bus from Lauterbrunen, passing the amazing waterfalls Trümmelbach and reaches Stechelberg. The waterfalls are the only such glacial natural formation to be seen in Europe. 1 km before Stechelberg is a huge bus station, which is the starting point for all the following resort and ski centers - Mürren, Grindelwald, Shilthorn and Wengen. Just at this location you can see a spectacular show of professionals bungee jumping. Located in the canton of Bern, Stechelberg is bordered to the south by the canton Wallis, from which it is separated by a line of jagged peaks and glaciers. It is located on the northern entrance of the protected area by UNESCO Jungfrau-Aletsch Protected Area, Stechelberg village is surrounded by pristine, undeveloped areas, mountain meadows and opportunities for many beautiful walks in the Alpine mountains. A walk around Stechelberg will allow you to enjoy the alpine forests and meadows covered with flowers, waterfalls and unique views of mountain peaks. 72 waterfalls can be seen in the area and the highest waterfall in Switzerland - Staubbach Falls, reaching a height of about 300 meters is here too. These beautiful natural attractions are the most impressive in rainy days. Stechelberg village has a good infrastructure and an abundance of small cottages and boarding houses for guests. There are various festivals traditionally held here - one with puppet shows, The Sound of Music is one of the most popular too. Stechelberg has highly developed animal care and everywhere you look, you can see the famous Swiss cows. Of course, the other important for the village sector is tourism. For guests of the settlement, they offer rooms to suit every pocket and many nice places to eat. Because Stechelberg is surrounded entirely by alpine steep hills, the danger of sliding stones here is not small. The last such avalanche strikes the village in 2003. On the tourist routes in the area are special shelters where tourists can hide in case of such dangers.